Rolled up banknotes, hollowed-out pens, cut straws, pointed ends of keys, specialized spoons, long fingernails, and (clean) tampon applicators are often used to insufflate cocaine. Such devices are often called "tooters" by users. The cocaine typically is poured onto a flat, hard surface (such as a mirror, CD case or book) and divided into "bumps," "lines" or "rails," and then insufflated. 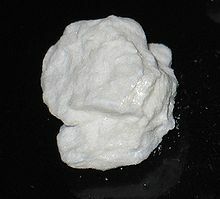 The amount of cocaine in a line varies widely from person to person and occasion to occasion (the purity of the cocaine is also a factor), but one line is generally considered to be a single dose and is typically 35 mg (a "bump") to 100 mg (a "rail"). [dubious – discuss] As tolerance builds rapidly in the short-term (hours), many lines are often snorted to produce greater effects. 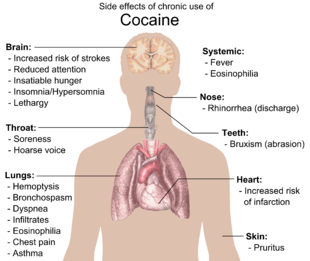 A 2001 study reported that the sharing of straws used to "snort" cocaine can spread blood diseases such as hepatitis C.
In 1995 the World Health Organization (WHO) and the United Nations Interregional Crime and Justice Research Institute (UNICRI) announced in a press release the publication of the results of the largest global study on cocaine use ever undertaken. However, a decision by an American representative in the World Health Assembly banned the publication of the study, because it seemed to make a case for the positive uses of cocaine. 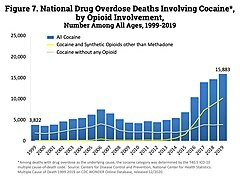 An excerpt of the report strongly conflicted with accepted paradigms, for example "that occasional cocaine use does not typically lead to severe or even minor physical or social problems." In the sixth meeting of the B committee, the US representative threatened that "If World Health Organization activities relating to drugs failed to reinforce proven drug control approaches, funds for the relevant programs should be curtailed". This led to the decision to discontinue publication. 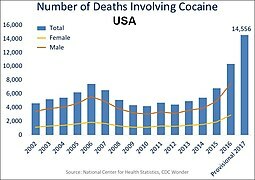 A part of the study was recuperated and published in 2010, including profiles of cocaine use in 20 countries, but are unavailable as of 2015[update]. 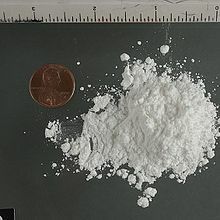 In addition to the amounts previously mentioned, cocaine can be sold in "bill sizes": As of 2007[update] for example, $10 might purchase a "dime bag", a very small amount (0.1–0.15 g) of cocaine. 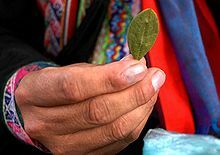 Twenty dollars might purchase 0.15–0.3 g. However, in lower Texas, it is sold cheaper due to it being easier to receive: a dime for $10 is 0.4 g, a 20 is 0.8–1.0 g and an 8-ball (3.5 g) is sold for $60 to $80, depending on the quality and dealer. These amounts and prices are very popular among young people because they are inexpensive and easily concealed on one's body. Quality and price can vary dramatically depending on supply and demand, and on geographic region. ^ Malenka RC, Nestler EJ, Hyman SE (2009). "Chapter 15: Reinforcement and Addictive Disorders". In Sydor A, Brown RY (eds.). Molecular Neuropharmacology: A Foundation for Clinical Neuroscience (2nd ed.). New York: McGraw-Hill Medical. p. 367. ISBN 978-0-07-148127-4. 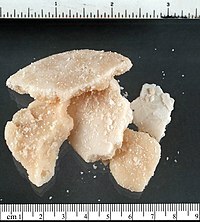 While physical dependence and withdrawal occur with some drugs of abuse (opiates, ethanol), these phenomena are not useful in the diagnosis of addiction because they do not occur with other drugs of abuse (cocaine, amphetamine) and can occur with many drugs that are not abused (propranolol, clonidine). ^ Hoffman BL, Schorge JO, Bradshaw KD, Halvorson LM, Schaffer JI, Corton MM (22 April 2016). Williams Gynecology, Third Edition. McGraw Hill Professional. ISBN 9780071849098. ^ Leveno KJ, Spong CY, Dashe JS, Casey BM, Hoffman BL, Cunningham FG, Bloom SL (12 April 2018). Williams Obstetrics (25th ed.). McGraw-Hill Education. ISBN 9781259644320. ^ Kolbrich EA, Barnes AJ, Gorelick DA, Boyd SJ, Cone EJ, Huestis MA (October 2006). "Major and minor metabolites of cocaine in human plasma following controlled subcutaneous cocaine administration". Journal of Analytical Toxicology. 30 (8): 501–10. doi:10.1093/jat/30.8.501. PMID 17132243. Archived from the original on 18 July 2012. ^ Hemscheidt T, Vederas JC (2000). Leeper FJ, Vederas JC (eds.). 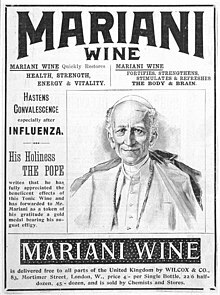 "Tropane and Related Alkaloids". Top. Curr. Chem. Topics in Current Chemistry. 209: 175. doi:10.1007/3-540-48146-X. ISBN 978-3-540-66573-1. ^ "Statistical Bulletin 2018 — prevalence of drug use | www.emcdda.europa.eu". www.emcdda.europa.eu. Retrieved 5 February 2019. 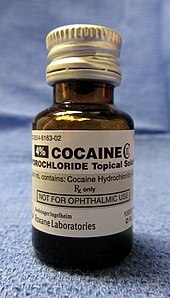 Wikimedia Commons has media related to Cocaine. 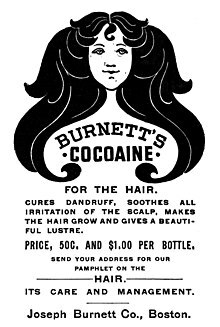 Look up cocaine in Wiktionary, the free dictionary.